RMS-ENT / RMS Enterprise is scalable client/server based software for IT and AV managers that provides remote management capabilities for AV assets and building systems. 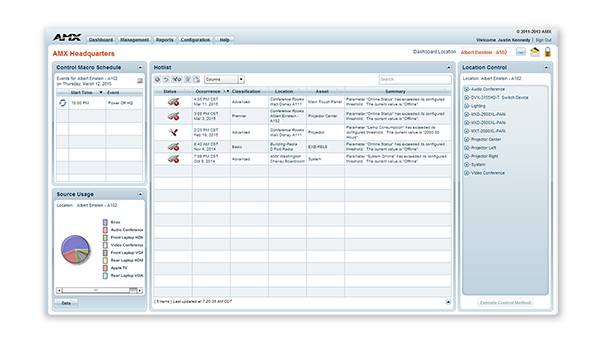 The software features a user-friendly dashboard that makes it easy to centralize the management and monitoring of AV equipment, lights, HVAC and other building functions. This allows users to solve technology issues before they become problems, such as identifying displays before a bulb burns out or receiving immediate notification when a device goes offline. With RMS, IT and AV managers can improve their response times, while end users can reduce the amount of time lost while waiting for meeting room equipment to function. With the new RMS Enterprise Update Manager, IT and AV Managers now have the ability to stage new AMX firmware, quickly identify AMX devices that are not up to the latest firmware revision, and mass deploy the new firmware to these devices simultaneously with just a few clicks of the mouse. RMS is also a green solution that saves money and the environment by reducing energy consumption by remotely turning off equipment when rooms are empty or at the end of the work day. RMS has the full range of features IT professionals would expect for enterprise software, including support for active directory, LDAP, existing SQL databases, and scalability across multiple servers. You can manage all of your buildings with a single RMS license, deployable from the cloud or on-premises. See RMS Enterprise Hosted Cloud Service for details on the cloud version. RMS includes a long list of standard and customizable reports, and gives you the ability to tailor your experience with a fully-configurable dashboard with easy-to-use widgets. RMS Enterprise also features the RMS Enterprise Scheduling Interface, which improves the efficiency of meeting spaces and technology by allowing users and support personnel to schedule meeting spaces and preconfigure room technology for upcoming meetings. RMS is a robust solution for corporate or government IT and AV managers to centralize the monitoring and management of AV devices and building systems across their facilities worldwide. 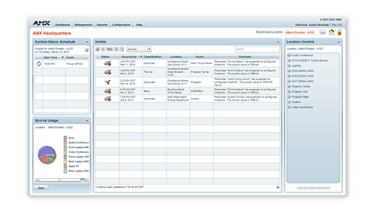 Enterprise Grade Software – RMS Enterprise provides large scale management for users, roles, and, tracking user activities including an audit trail of who performed each activity and when it was completed. The server software supports authentication, encryption and protection from cross-site scripting to prevent security threats. Server Hardware Requirements Processor: Dual core Intel Xeon processor @ 2.67GHz (or equivalent) Memory: 8 GB Display: 1280 x 1024 resolution Hard Disk: 1 GB available space for RMS Enterprise application files; an additional 20 GB of space is needed for log files and firmware files. Supported Server Operating Systems Microsoft Windows Server 2012 SP2 (x64), Microsoft Windows 2008 Server R2 (x64). See Data Sheet for details.